National Park Service, Edison National Historic Site. "If I didn't invent the incandescent lamp, I never invented anything." -- Thomas Edison, speaking to the editor of The Electrical Review, 1892. A patent legally grants an inventor a monopoly on their invention for a set period of time. Article 1, section 8 of the U.S. Constitution gives Congress the power: "To promote the progress of science and useful arts, by securing for limited times to authors and inventors the exclusive right to their respective writings and discoveries." Once granted, it's up to the inventor to protect the patent. 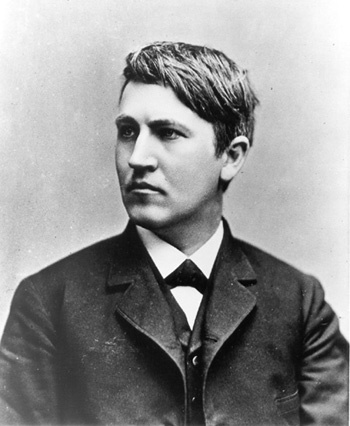 Edison's statement above, was made during the waning days of a patent suit brought against the United States Electric Lighting Company. U.S. Electric Lighting was charged with making incandescent lamps without paying royalties to Edison -- or "infringing" on Edison's patent. The case began in 1885 and a decision was handed down in favor of Edison by Judge William J. Wallace in July, 1891. U.S. Electric, purchased by George Westinghouse in 1888, appealed this decision arguing that the work of other inventors predated that of Edison. That argument prompted Edison's satirical comment. The Circuit Court of Appeals upheld Judge Wallace's decision in October, 1892. That $15 million would be almost $270 billion today. As it turned out, General Electric filed for injunctions against Westinghouse and other companies, preventing these competitors from making lamps similar to Edison's. However, other patents did exist and competitors retooled their factories and produced lamps that were just different enough to be legal. Until Edison's patent expired in 1897 that is, when they went back to making Edison-style lamps.